April 2005: My old mobile phone died horribly, so I went to a shop and got a new one. I would have got a cheap one that does nothing except phone and send text messages, but since this is Germany and I use the mobile a lot, my provider was willing to provide me with an expensive one for peanuts. The cheap ones all felt cheap in my hand so I got a Nokia 6230, which does more or less everything except cook doughnuts. It came with a software CD so your computer can talk to it, but I didn’t buy a cable to connect it to the computer (which would have cost more than I paid for the phone), and my computer didn't have Bluetooth, so the CD landed in a drawer. June 2005: Later, I got a new notebook. It has Bluetooth. So I installed the Nokia software on it from the CD. Following the instructions, I attempted to connect the computer and the phone. But the software couldn't find the phone. Had Nokia packed the wrong CD in with the phone? 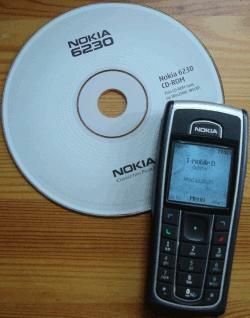 No: Nokia 6230 was printed clearly on the CD. Maybe there was a bug in the software? I had a look at the Nokia website to see if there was an update available. There I found a list of which software versions would work with which phone. Which indicated that the software I had on the CD – with the name of my phone printed on it in nice big type – was not suitable for my phone. Nokia is the world’s leading supplier of mobile phones. October 2012: I have been using the phone more or less continuously ever since. I have had to replace the battery a couple of times, but otherwise everything still works fine.